Patent Trolls: How they stifle innovation. 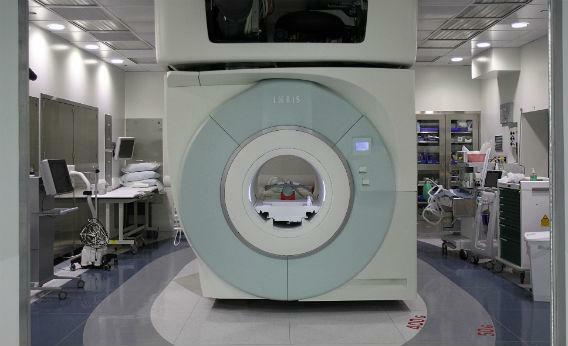 An MRI is the kind of health care technology that might be stifled by patent trolls. Photograph by Suzanne Kreiter/The Boston Globe via Getty Images. When hospitals come upon a technology with a proven track record of saving lives, you’d expect a flood of investment to expand its use, and a race by manufacturers to bring new products to market. Digital medical records, which give physicians quick and easy access to patients’ case histories, is an example of such a technology. Over the past dozen or so years, hospitals across the country have gone digital, leading to better patient outcomes and making hangar-size file-storage facilities obsolete. But even as more hospitals opted into using computer records, the leading vendors of picture storage software—an important component of medical records—completely stopped introducing new products to the market. Why, precisely when the market for their product had just taken off, would companies stop innovating? An explanation comes from Catherine Tucker, an economist at MIT who has studied the medical IT sector. In an unpublished study, she shows that the slowdown in R&D occurred as a result of litigation by a company whose primary reason for existing is to acquire the rights to others’ inventions and file patent claims against producers of related products—a patent troll. Tucker’s study is, to date, one of the best pieces of quantitative evidence of the broken state of America’s patent system, a critical concern not just for improving health care but for encouraging the innovation that’s needed to ensure future economic prosperity. Patents exist for good reason—to allow inventors to reap the spoils of the creativity and hard work required to come up with a “new and useful” product. If we could all sponge off the inventive efforts of others, who would bother coming up with new ideas in the first place? At the same time, ideas are different from physical property, like a house or a machine that two people or companies can’t use at the same time. Ideas are “non-rival” in nature, which means everyone can use them at once, and they don’t wear out from use. We allow patents to expire after a number of years so they can eventually be used by everyone, and we permit inventors to license their use to others in exchange for payment, so the greatest number of people benefit from innovations even in the short run. We also let people buy and sell ideas—the same as a house or car—to allow their rights to be transferred to those who can make the best use of them. Biotech companies can focus on developing new drugs, then transfer their ownership to pharmaceutical giants that can manufacture and market them. The much-romanticized solitary inventor can focus on coming up with new ideas, then sell them off to someone better suited to selling licenses or using an application. That’s where patent trolls—the more polite term is patent assertion entities—come in. They are companies set up for no other purpose than buying and exploiting the inventions of others. At times, they do it by licensing technologies—precisely the type of activity that creates a market for inventions, which in turn encourages innovators who might not otherwise expect to earn a return from their work. But often, trolls buy patents with the intent of suing first and asking questions later. That’s what happened in the case for picture archival and communications systems, or PACS, which store medical images from ultrasounds, CT-scans, and other diagnostic tests. In the mid-’90s a surgeon and engineer team in Tampa filed a patent that described a system for sharing medical images via communications networks. They were exactly the sort of solitary inventors that a market for ideas is meant to help, and indeed they sold their patent to the innocuous-sounding Acacia Research Corp. in 2005. According to Acacia, a number of companies were already treading on their intellectual property, including such deep-pocketed industrial giants like GE Healthcare, Siemens, and Philips, all of whom produced PACS and were served notice of a lawsuit in an out-of-the-way Eastern District of Texas court that is particularly friendly to plaintiffs in intellectual-property disputes. Tucker found that the market for imaging software was put on ice by the Acacia lawsuit—among companies named in the suit, imaging software sales dropped more or less in half after the suit was announced. There was no change in sales for their text-based software sales. This wasn’t the result of a leveling off in demand for imaging software, which continued to grow in 2008 and 2009. And sales at smaller companies not named in the Acacia suit continued apace after the lawsuit announcement. Why the slowdown in sales? Imagine what would happen to iPhone sales if Apple’s last product was its 3G phone introduced in 2009: Android-based devices would be running away with the market. Tucker claims that at least part of the reason imaging software sales were slowed by the Acacia suit is that R&D at the affected companies went into a deep freeze. In the two years following the suit, none of the defendants came out with a single new version of their products, while improvements continued in their text-based systems and at smaller competitors not subject to the suit. Given the nature of U.S. patent law, it’s easy to understand why—a company that continues to develop new products while targeted with a patent suit is guilty of “willful infringement” if it loses the case and is then subject to triple damages. So the court need not even rule in favor of patent trolls like Acacia to slow down innovation—merely the threat of a possible guilty verdict is enough to put R&D on hold. Before joining the lynch mob that’s after Acacia and its fellow patent trolls, it’s important to remember that encouraging innovation involves a delicate set of tradeoffs. Acacia claims it is merely defending the intellectual property of small-scale inventors whose ideas would have been usurped by multinational bullies without patent trolls to license and litigate on their behalf. That’s what has led some people to sing their praises. Some research even goes so far as to suggest that we’d get no less innovation if there were no patent protection at all: In a fascinating study of innovations presented at two World’s Fairs in the 19th century, economic historian Petra Moser compares inventions exhibited by countries with varying degrees of patent protection. The exhibitions, which allowed for a global exchange of technology, patented and otherwise, drew on the very best ideas from countries eager to show off their technological prowess. Awards for the most innovative and useful exhibits provided Moser with a ready measure to assess the quality of each country’s entries. The results might surprise patent trolls and their defenders—there were three countries that had no patent protection whatsoever at one or more of the two exhibitions: Switzerland, Denmark, and the Netherlands. Yet their innovations fared just as well in competition as those from Belgium and France, which gave 15 or 20 years of protection to patented ideas. It’s not that Swiss and Danish inventors were oblivious to theft of intellectual property—they focused on invention in areas where secrecy was relatively effective in keeping ideas from others, namely scientific instruments and food processing. But overall they were just as innovative. Patent laws aren’t going to disappear anytime soon. But work like Tucker’s is beginning to show that the system we’ve got is often achieving the opposite of its intended purpose. If we want to ensure that Americans keep innovating, we probably need to produce fewer lawyers trained to pursue patent litigation, more inventors to create new ideas, and weaken the laws intended to protect them.